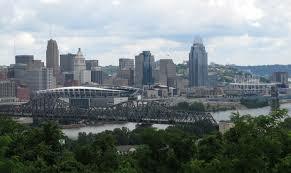 As Ohio’s third largest city, Cincinnati boasts an urban population of around 300,000 people. Meanwhile, the Greater Cincinnati population stands at a little over 2 million, making it the 28th largest metropolitan area in the United States. With such a densely populated metropolitan area, comes a wide range of pest issues. The following will discuss some of the more common of these for the Cincinnati area. Cincinnati is positioned between two different climate zones in what is known as a ‘climactic transition zone’. The south of the city area is covered by the ‘humid subtropical climate zone’, while the north experiences a ‘humid continental climate’. As a result, there is a fair degree of variation in Cincinnati weather systems. Summers are typically hot and humid, and winters are cold and snowy. Severe thunderstorm activity is common in the summer and more extreme weather events such as tornadoes, though infrequent, may occur in the Cincinnati area. This climate profile of the city sees Cincinnati experience typical pest problems found in much of the eastern United States. Common pest problems in and around Cincinnati include bedbugs, termites, and ants. Ants can be an annoying household pest as they enter a home in a seemingly never-ending flood. These pests are normally attracted to food sources in the home, with the kitchen being a common point of entry. To prevent ants and other scavenging pests from becoming a problem in a domicile, potential food sources should be cleaned away and food and refuse stored securely. An effective way to block ants from coming into your home, is to create a stick soap and water mixture which can be used as a barrier to clog up entry points. A certified pest control agent can also offer effective treatment and prevention options to keep a home from becoming overwhelmed by these pests. ‘White ants’ or termites can be a less obvious concern for homeowners than common ants; however, they can prove to be a more serious pest problem. Termites invade the very structure of a home, where they nest and feed on the lumber of a building. This can lead to significant structural damage to a home, with undisturbed termite populations having the potential to cause irreparable damage to homes throughout Cincinnati suburbs. Termites can be identified by searching for signs of infestation around a property. Normally, the most obvious sign of a termite problem is the presence of sawdust like termite feces near the infested area. If a termite problem is detected, a pest control agent should be contacted without delay as these pests can do very serious damage to a home if left unchecked. There are quite a number of reputable pest control service providers in the Cincinnati area. One such of these is Scherzinger Pest Control, who has been serving the Cincinnati area for pest removal since 1934. This family owned and operated pest control agency offers a range of treatments for common household pests and also offer specialized pest prevention services. Other well-known pest control services in the area include Valley Termite & Pest Control, Sure Thing Pest Control and Perfection Pest Control Inc.